This year, I don’t want tons of presents. I only want one. I saw it the other day at this big house in London called the Victoria & Albert. Inside were thousands of old things from around the world, and in the middle of the old things was something called an “exhibition”. Exhibitions are like the stuff you keep under your bed, only bigger. This one had a funny name, Bejewelled Treasures. I’m not sure what “bejewelled” means — I think it’s like vajazzled, which is a word Auntie Camilla taught me, only not as naughty. But treasures are what Aladdin had in his cave, and what Sir Francis Drake was always stealing from the Spanish. So that’s what I want for Christmas, Santa. 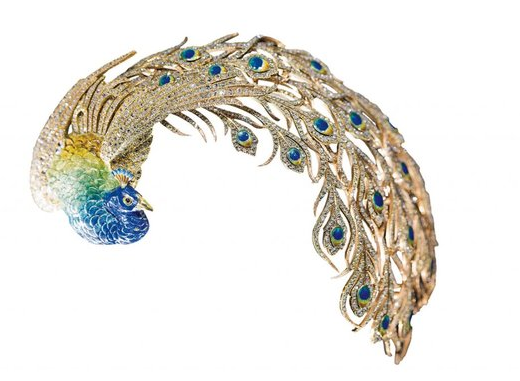 Can I have Vajazzled Treasures at the V&A? Can I? The exhibition was just like your grotto. Really dark and full of stuff that makes your eyes pop. The walls had pieces of paper stuck on them, which told you that the treasures had been borrowed from the collection of somebody called Mr Al Thani. Apparently he lives in a country called Qatar, where his job is to rule everyone and spend money on buying anything he wants. That’s such a great job, Santa. When I grow up, can I rule people and buy whatever I want? Mr Al Thani must have a really, really big piggy bank, because he only buys things that cost millions of money. All the other people in his family buy anything they want as well. One of them is a girl called Ms Al Majassa Al Thani. She’s a sheikha. That’s like a sheik, except a girl. She buys something called “contemporary art”. She likes an artist called Jeff Koons, who makes giant balloon dogs, and another artist called Damien Hirst, who is good at painting dots. The rulers of Qatar are buying these things to put in some big houses they are building called “museums” and “art galleries”. They even bought a picture of some people playing cards, by an artist called Paul Cézanne, that cost $250m. Nobody has ever spent that many millions of money on a picture before. Their piggy bank must be megahypersupergigantic! I’ve never been to Qatar, but with all these balloon dogs and paintings of card players and dots everywhere, it must be really pretty. I bet all the other people in Qatar are really happy their rulers are spending millions of money on such nice things. Mr Al Thani collects rocks, like the different types of rock from my holidays that I keep in a box under my bed, except that Mr Al Thani’s rocks are see-through, and they make you go mad. One of the first in the exhibition is pink. Apparently, pink see-through rocks are really rare. This is one of the biggest ever found, and it flashes thousands of lights at you from deep inside, as if it’s exploding. I kept staring and staring at it, Santa, and I could feel my head going funny. My tongue began to slide out of my mouth, and I must have looked really stupid standing there with my tongue flapping against my chin. Mr Al Thani is an expert on India, so that’s where most of his famous see-through rocks come from. Another one at the start of the show, called the Idol’s Eye, is a beautiful pale blue. Dad has a poster on the wall of an old idol called Paul Newman, who had eyes as blue as this. But large gold statues of gods are also called idols. And this particular idol in India had eyes that were so beautiful, someone stole them, which inspired a famous book called The Moonstone, written a long time ago by Wilkie Collins. I wonder if he was related to that writer Mum loves reading, Jackie Collins? After it was stolen, the Idol’s Eye brought bad luck to the people who owned it, including another ruler called Imelda Marcos, who was famous for collecting shoes. She collected see-though rocks, too, so the people she ruled must have loved her very much, just as they love Mr Al Thani and his family in Qatar. Another rock you see in the exhibition is called an “emerald”. These are green and come from a place called Colombia. Some of them are as big as ping-pong balls. The most beautiful ones have been put in necklaces by people called maharajahs, who were the rulers who came after the Mughals. The maharajahs had necklaces made for them in which the emeralds were mixed with pearls, so you’d get a big emerald, then four big pearls, then another big emerald, then four more pearls, all the way round the necklace. When I saw that, Santa, my mouth began dribbling uncontrollably and my school tie got really wet and yucky. The same thing happened with the other types of big rock that Mr Al Thani collects, called rubies, sapphires and spinels, which are like rubies, but paler. Although most of the Vajazzled Treasures come from Mr Al Thani’s collection, there are some that have been borrowed from our own ruler, the Queen. She used to own India, or at least her great-great-granny did. But the Queen’s family weren’t always nice to the Indian people. In 1799, they sent an army to a place called Mysore to conquer a ruler called Tipu Sultan, and when they beat him in the war, they stole all his treasures, including his famous gold throne, which the soldiers who won the war broke into bits and took home. Some of the pieces ended up belonging to the Queen, such as a beautiful gold bird covered in diamonds, emeralds and rubies that used to sit on top of the throne. The Queen has lots of things from India. She also owns a dark, blood-coloured rock called the Timur Ruby (it’s not a ruby, it’s actually a spinel, and it didn’t belong to Timur), which has writing all over it, put there by the Mughal rulers who used to own it before her, such as Jahangir and Shah Jahan, who was famous for building the Taj Mahal. A cool thing about the exhibition is that it goes right up to today, with some modern pieces with see-through rocks made by a company called Cartier. One of the old members of this family, someone called Jacques Cartier, went to India in 1911 and learnt how to make see-through rocks the Indian way. Then he went back to France and copied them, inventing a new style called “art deco”. Anyway, Santa, now I am home and my eyes have stopped throbbing, I have decided that I like Vajazzled Treasures so much, I want it for Christmas. That’s not asking too much, is it?